Energy Systems Southeast is ready to help you select the right standby power system to fit your specific needs and budget. Since Generac offers single-engine diesel generators in sizes up to 2 MW – we have multiple options, all offering outstanding reliability for a variety of applications. Our sales team will evaluate your specific needs and use proven Generac sizing software to determine the best fit for your needs. Often only a single generator solution is needed. Generac offers a variety of fuel choices – gas, diesel and bi-fuel options (the only bi-fuel system that is EPA compliant right from the factory). If a single generator doesn’t meet your needs Generac offers the ability to parallel several generators into flexible, multi-megawatt power solution. The MPS system also give you the flexibility to add more capacity as needed. Even mix and match fuel types. Generac’s Modular Power Systems (MPS) boast a rate of up to 99.9999% reliability, and they are more cost-effective and flexible than single generators with the same load capacity. Generac also offers the Gemini power system – an MPS system designed for use in areas where space is at a premium. This system includes two 500kW systems run in parallel and situated in a single enclosure. Whatever the application, Generac offers flexible design solutions that can be tailored to fit your very specific needs. Call us to learn more! This multi-part article is designed to help engineers, contractors, and other specifiers understand the stringent requirements for hospitals—as people’s lives are on the line when the power goes out. In Part 1: Hospital Emergency Power Design, Generac addressed Circuit Requirements and Selective Coordination was discussed. In Part 2, we will highlight Separation of Circuits and Disconnect at Point of Entry. Separation of circuits is the concept in the National Electric Code that prevents a critical failure in one circuit from impacting others. This is implemented through separation of wiring and separation of components. The wiring from the load side of an emergency transfer switch must be kept completely isolated from other load circuits. This is covered in NEC 700.10(B) which requires the wiring from the emergency source or emergency source distribution overcurrent protection to emergency loads to be kept entirely independent of all other wiring and equipment. Exceptions are provided for wiring inside a transfer switch, exit lights, emergency luminaires, and unit equipment. What has been somewhat confusing over the various code cycles is the concept of the separation of equipment. It has always been well understood that the transfer switches for emergency and non-emergency circuits needed to be isolated into separate transfer equipment. What was less clear was the separation of the circuit breakers feeding these transfer switches from the emergency side. The NEC clarified this with NEC 701(B)(5) that required these breakers to be in “separate vertical sections”. This is illustrated in the diagram below. NEC 700.10(B)(5) clarified that the common bus feeding this vertical section could be fed from a common generator feeder. This is a fairly typical configuration for a single generator application. The generator feeder may be a main lug configuration without a generator breaker or it could be fed from a generator breaker, provided the breaker is selectively coordinated. NEC 700.10(B)(5)(d) also clarified that the emergency distribution equipment can be fed with multiple feeders, which is the case when parallel generation is utilized. What is not clearly identified within the NEC is the requirements for separation of circuits within the generator connection box. NEC 700.10 makes it very clear that external to the generator each circuit type must be isolated. But what about applications that utilize multiple breakers within the generator? This is very common for smaller applications that have only 2 or 3 transfer switches. This ultimately is an Authorities Having Jurisdiction (AHJ) interpretation, but Generac believes good generator design should extend separation of circuits within the scope of the generator connection box. 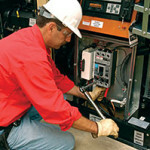 Generac utilizes separate connection boxes for each breaker to ensure the most stringent interpretation of separation of circuits is met. The power conductors from the generator are classified as a feeder within NEC 100. Often times the generator is located outside; thus, creating an outdoor feeder entering the building. NEC 225.31 requires these feeders to include a disconnect and be located at the point of building entry (NEC 225.32). NEC 700.12(B)(6) allows this disconnect to be located at the generator provided the disconnect is readily assessable and within sight of the building. Given that the generator breaker(s) are generally within the generator enclosure and not visible, most applications should require an additional disconnect at point of entry. One will see the implementation of this to be extremely varied within the market. Many markets accept the close proximity of the generator and its easy accessibility as sufficient to meet the intent of the code for feeder disconnect. In essence, the AHJ may consider the internal generator disconnect(s) much more accessible than a feeder breaker secured inside another building. This easy accessibility meets the local markets interpretation of the codes intent. Please coordinate with your local market AHJ to ensure requirements for disconnect are being met, whether it is a breaker integral to the generator assembly or a disconnect at point of building entry. NEC 700.12(B)(6) does specifically allow the generator disconnect to be not visible when specific conditions are met: “For installations under single management, where conditions of maintenance and supervision ensure that only qualified persons will monitor and service the installation and where documented safe switching procedures are established and maintained for its connection, the generator set disconnecting means shall not be required to be located within sight of the building or structure served”. NEC 225.36 traditionally required the disconnect at point of entry to be service entrance rated which requires overcurrent protection. This section was revised for the 2014 Code. The disconnecting means is now only required to be suitable for use as service equipment when the bonded neutral is also used as the return path for ground-fault current. This is the case for a non-separately derived (3-pole transfer switch) configurations. Configuring the system as a separately derived system (4-pole transfer switches), would allow the disconnect at point of entry to not include overcurrent protection. This is potentially helpful in providing additional design choices in supporting selective coordination design challenges. If you would like more information about emergency power design considerations please contact us. Have you heard about our summer promotion? 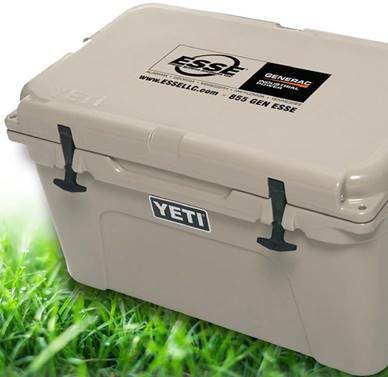 You can earn the original heavy-duty cooler, the Yeti Tundra 45! Contact your local sales rep for more information on how you can get your hands on the best heavy-duty cooler around. Hurry, this promo runs through August 31, 2016.